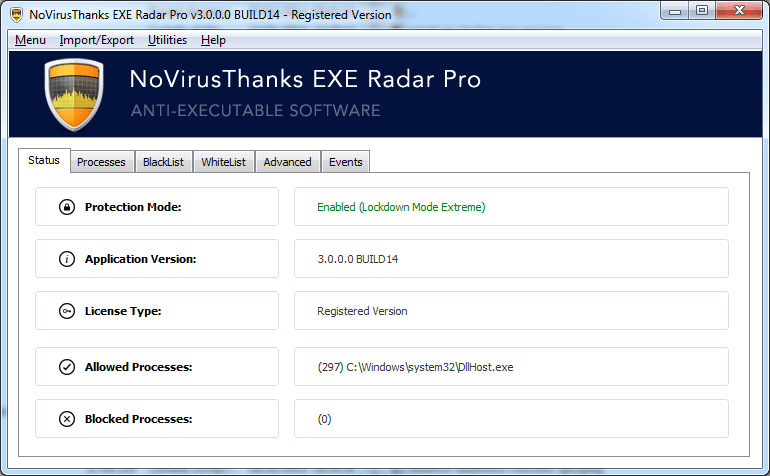 EXE Radar Pro is a powerful anti-executable and application whitelisting software designed to monitor every process that is executed in your system. You can fully control which applications are allowed to run, block unknown applications and keep your PC safe from malware and trojans. You can whitelist a process by process file name, MD5 hash, signer, parent process, and much more. Traditional signature-based security software may not be able to protect your system effectively. Add a new layer of protection to your system with this program, monitor processes executed in the system and block malicious applications not detected by other security software. You can whitelist all safe applications and automatically block the rest or be alerted and choose to allow or block an unknown application. Gain full control on what processes are allowed to run in your system. Create a whitelist of safe applications matching many process-related parameters. Whitelist applications by parent process, file hash, signer, file name, etc. Allow or block a process by filtering also the command-line string. Easily create rules to whitelist applications with the smart Rules Builder. Manage rules easily with pagination, search option and column sorting. You can add a comment on each rule to better recognise a rule. Select if you want to block an application, allow it or be alerted. Filter execution of system processes like cmd.exe, regsvr32.exe, powershell.exe. Divide rules by categories, such as Vulnerable Processes, Windows Processes, etc. Try the product for 30 days without any limitations before buy a license.